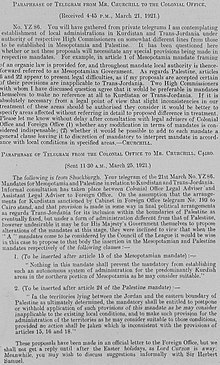 The Transjordan memorandum was a British memorandum passed by the Council of the League of Nations on 16 September 1922, as an addendum to the British Mandate for Palestine. The memorandum described how the British government planned to implement Article 25 of the Mandate, which had been drafted during the March 1921 Cairo Conference to include Transjordan in the Mandate without applying the provisions regarding Jewish settlement. British Government proposal to include Transjordan within the Palestine Mandate via what became "Article 25"
The British Mandate administration in Jerusalem only ever covered the area west of the Jordan, while the area east of the Jordan was administered by the British representative in Ma'an, Captain Alex Kirkbride until the arrival in November 1920 of Abdullah bin al-Hussein, the future Emir. Following the expulsion of Faisal bin Hussein from Syria by the French in July 1920, and the subsequent Cairo Conference, March 1921 they appointed Hussein Emir of Transjordan, while assuring that no Jews would be allowed to settle in Transjordan. Article 25 of the Mandate for Palestine allowed for the exclusion of Transjordan from unspecified provisions of the Mandate. On 16 September 1922, Lord Balfour, representing the United Kingdom, reminded the Council of the League of Nations of Article 25 of the Mandate for Palestine (which had been previously approved but had not yet come into effect). He then told the council that the British government now proposed to carry out this article, as had always been intended by the League of Nations and the British government. He then presented a memorandum for approval. all territory lying to the east of a line drawn from a point two miles west of the town of Akaba on the Gulf of that name up the centre of the Wady Araba, Dead Sea and River Jordan to its junction with the River Yarmuk: thence up the centre of that river to the Syrian frontier. The same boundary had been specified by the High Commissioner in September as the line delimiting the region to which the Palestine Order in Council applied. In the application of the Mandate to Transjordan, the action which, in Palestine, is taken by the Administration of the latter country will be taken by the Administration of Transjordan under the general supervision of the Mandatory. His Majesty's Government accept full responsibility as Mandatory for Transjordan, and undertake that such provision as may be made for the administration of that territory in accordance with Article 25 of the Mandate shall be in no way inconsistent with those provisions of the Mandate which are not by this resolution declared inapplicable. From that point onwards, Britain administered the part west of the Jordan as Palestine, and the part east of the Jordan as Transjordan. Technically they remained one mandate, but most official documents referred to them as if they were two separate mandates. In May 1923 Transjordan was granted internal self-government with Abdullah as ruler and Harry St. John Philby as chief representative. ^ a b League of Nations Official Journal, Nov. 1922, pp. 1390–1391. ^ Herbert Samuel (September 1, 1922). "Order". Official Gazette of the Government of Palestine. Extraordinary: 16. ^ 12 August 1922 Archived 25 November 2013 at the Wayback Machine Britain is given the Mandate of the League of Nations to Administer Palestine. ^ Avi Shlaim (2007) p. 14.